Born in 1978, Andrea Muggiano grew up with a strong passion for cooking which has turned into a rewarding and recognized career. 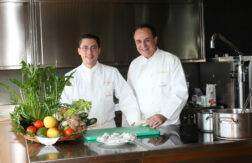 Voted “Best Young Commis Rôtisseur” in 2001 and today a member of Euro-Toques Italia, he has a long career behind him, highlighted by decisive encounters: with Luciano Tona of ALMA in Parma; in Campione d’Italia with Bernard Fournier; with Pietro Leemann at Joia in Milan; then in Ticino, his adopted home for the past 16 years, mainly at star chef José de la Iglesia’s Motto del Gallo, from whom he has assimilated extraordinary creativity. In 2010 he met with the Lucchini family. Launched with de la Iglesia, today he proudly manages the first private Swiss club entered in the Chaîne de Rôtisseurs, combining tradition and innovation, history and technique. Flanked by Sous-chef Alessandro Piardi, he creates exquisite dishes, using garden produce and fruits grown on the property in accordance with the seasons. His menus are based on an extensive knowledge of cuisine with the addition of masterful sensitivity and imagination. The freshest produce and traditional dishes are interpreted with his personal touch, merging into a style of contemporary cuisine to be thoroughly enjoyed.